Pearl Jam's Eddie Vedder during the band's headline set on Saturday 14 July. 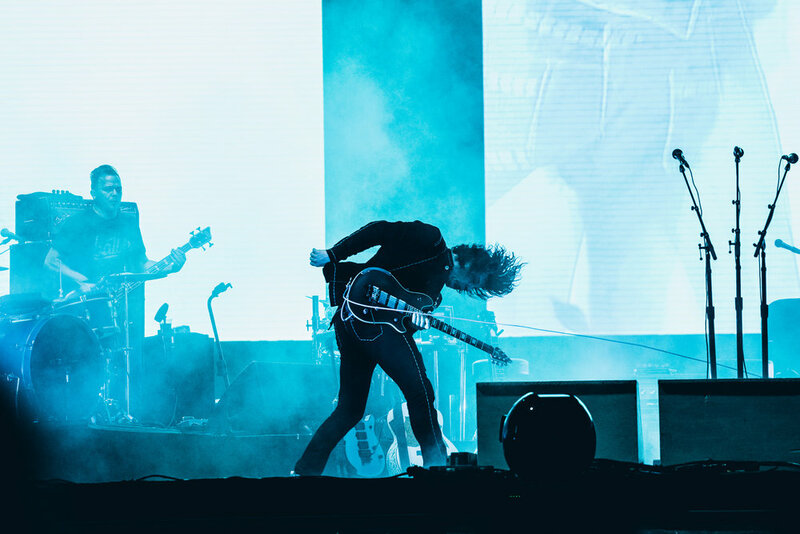 Jack White throwing shapes during his raucous performance on Saturday 14 July. The crowd getting ready for the first night of action, Thursday 12 July. Alex Turner gets into croon mode during the band's thrilling set on opening night, Thursday 12 July. View from the crowd during Arctic Monkeys' show, Thursday 12 July. Trent Reznor basks in the limelight during Nine Inch Nails' performance on Thursday 12 July. The crowd inside the Sagres stage. Bryan Ferry salutes an adoring crowd during his appearance on the Nos Stage, Thursday 12 July. Josh Homme and his gang amp up the noise during Queens Of The Stone Age's headline set on Friday 13 July. Gary Lightbody leads the way as Snow Patrol reach for the skies on Thursday 12 July. Who said it's too hot for leather? Not Black Rebel Motorcycle Club, performing on Friday 13 July. The National make some music for the masses on the Nos Stage, Friday 13 July. The crowds gather to witness SOPHIE's mind-bending electro on the NOS Clubbing Stage, Thursday 12 July. Wolf Alice's Ellie Rowsell leads her band into battle during their set on Thursday 12 July. No one knows him like the piano... even though this is actually a synth. Sampha on Thursday 12 July. Chvrches' Lauren Mayberry makes the sign of the cross, Friday 13 July. Early-bird tickets for next year's Nos Alive are now available to purchase from here.